Should the City of Minneapolis Have a Minimum Wage Ordinance? Our elections department is filming a series of videos with Council Members to encourage voting. Watch my video by clicking on the photo above. For more details about voting, including polling locations, early voting info and sample ballots, visit vote.minneapolismn.gov! 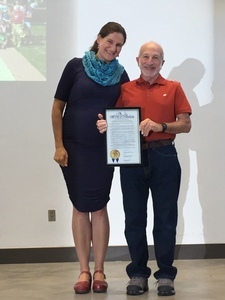 On Oct. 1 at a community ice cream social held in his honor, I presented Tom Neiman with a resolution honoring him for his 43 years of service to Southwest Minneapolis. It was a unanimous act of City Council. Tom started the Southwest Community Education Program in 1974 as a way for members of the community to do things they had never done before. During his tenure as the coordinator for the program, he encouraged thousands of kids and adults and created numerous successful community programs, including the popular Southwest Super Summer Program. Anyone who knows Tom (and I'm sure that many of you do!) knows that he is a great asset to our community and an inspiration to all of us. Even though he is retiring, Tom assures me that he is going to stick around and continue to volunteer. Please join me in thanking Tom Neiman for decades of outstanding service with Southwest Community Education and his commitment to residents of Southwest Minneapolis and for his tireless work on behalf of the well-being and education of families, youth, neighborhoods, and communities. We wish Tom all the best with his retirement! 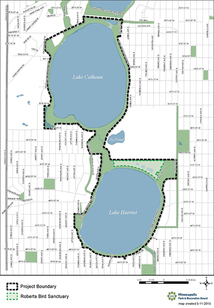 The Minneapolis Park & Recreation Board is hosting a second public meeting for planned trail and access improvements around Lake Harriet and Lake Calhoun. Improvements will focus primarily on pedestrian and bicycle circulation at Northeast Calhoun and Southeast Harriet, as well as general trail and access upgrades around both lakes. Park users are encouraged to attend to review and discuss the preferred concept, ask questions and share ideas. The first open house for this project was held on Oct. 4 (see materials from that meeting here). Get more information on the Calhoun-Harriet Trail and Access Improvements project page. Mayor Betsy Hodges presented her 2017 recommended budget to the City Council on Aug. 10. My colleagues and I will be engaged in considering the budget from now through early December. The final approval of the 2017 budget is scheduled for Wednesday, Dec. 7. To see the full details of the mayor's proposed budget, visit the City's website. I've already heard feedback from many constituents expressing their concern over the proposed levy increase for 2017 (read Mayor Hodges' budget address here), and that will shape my work over the next few weeks. The City is currently in the process of putting together the Minneapolis Comprehensive Plan (Minneapolis 2040), which will shape future development of our city. Your input is crucial in making sure this plan reflects the needs and priorities of the residents and there is an easy way to do so. The City has put together a "Meeting in a Box" that allows you to host a meeting with your neighbors, complete a survey and return the feedback to the City. This can be easily downloaded by clicking here. This month, I spent several hours touring Ward 13 with the new Public Works Director, Robin Hutcheson, to give her a better understanding of the issues that need attention and the priorities of my office. There are several public works issues that are unique to Ward 13 and I wanted Robin to see firsthand how these impact our neighborhoods. 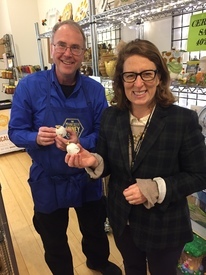 We included a visit to Minnesota Honey, one of our great local businesses at 50th and Xerxes. In 2015, the City Council requested a study on the effects of a municipal minimum wage ordinance in Minneapolis. Earlier this month, those results were presented to the Council's Committee of the Whole. Earlier this fall, Council directed staff to prepare a draft municipal minimum wage ordinance for spring 2017, as well as to develop an engagement plan to involve interested stakeholders. See here for more details on the study and next steps. We'll be sure to share more in the future about how to be involved in the discussions. As always, please reach out to my office to share any feedback you may have! Our focus on responsible budgeting and paying down debt is paying off. Minneapolis has been assigned some of the highest credit ratings of cities in the country from all three major rating agencies. As a result of the high ratings, the City was able to sell bonds totaling $119 million at an interest rate of 1.45%. Some of these bonds ($33 million) refunded previously issued bonds, leading to future interest savings of nearly $5 million. High bond ratings and positive comments from the ratings agencies enable the city to save taxpayer dollars by issuing bonds and borrowing funds at the lowest possible interest rates. For reasonable accommodations or alternative formats please contact the 13th Ward office at 612-673-2213, or Ken Dahler via ken.dahler@minneapolismn.gov . People who are deaf or hard of hearing can use a relay service to call 311 agents at 612-673-3000. TTY users can call 612-673-2157 or 612-673-2626.